Toronto — Celebrating the 150th anniversary of Canada’s confederation in their own unique way Jewish, Ukrainian, Armenian, Greek and Rwandan communities came together on December 3 in a one-day Conference on Genocide, Multiculturalism and Human Rights. 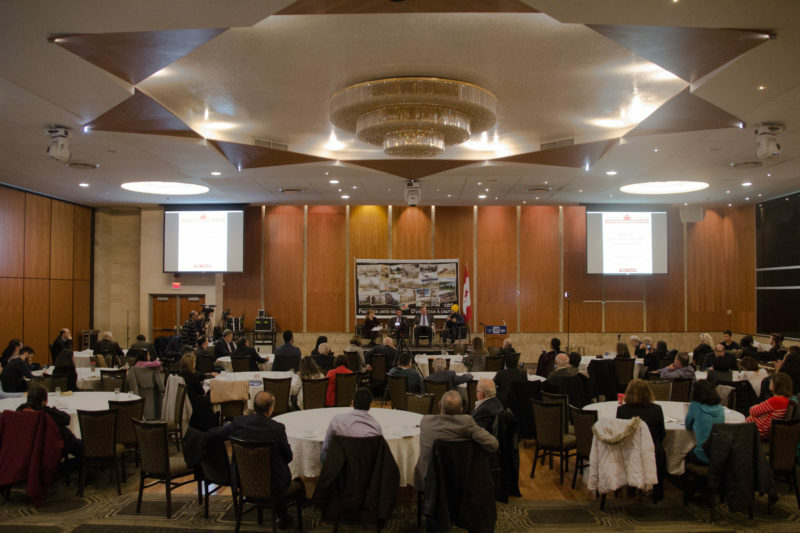 Organized by the Armenian National Committee of Canada (ANCC), in collaboration with the Holodomor Research and Education Consortium (HREC), the conference entitled “Canadian Stories: Shared Experiences Over 150 Years” was held at the Armenian Community Centres of Toronto, Montreal and Vancouver simultaneously and broadcasted live. The conference examined the history of early Genocide experiences and Canada’s response to them, the evolution of Canadian multiculturalism and the pivotal role Canada should play in International human rights today. «The conference attained its main goals of showing our collective responsibility to a shared history and presenting a strong position paper to the Government of Canada, outlining the findings of the conference,» said Marianne Davitjan, chair of the organizing committee. Endorsed by the Raoul Wallenberg Centre for Human Rights (RWCHR), the Centre for Israel and Jewish Affairs (CIJA), the Ukrainian Canadian Congress (UCC), the Canadian Hellenic Congress (CHC) and the Rwandan Humura Association, ANCC and HREC presented an impressive program, featuring renowned individuals from across Canada, including Indigenous Legal expert Jessica Labranche;, Jonathan Kay, a world renown journalist;, Jagmeet Singh, Leader of the Federal NDP;, John Young, CEO of the Canadian Museum of Human Rights, and Dr. Irwin Cotler, founder and chair of the RWCHR and Canada’s former Minister of Justice. The conference also featured the expert opinion of MP Arif Virani of Parkdale-High Park and Parliamentary Secretary to the Minister of Heritage, MP Garnett Genuis of Sherwood Park-Fort Saskatchewan, MP Anthony Housefather of Mount Royal, renowned professors of history, Dr. Frank Sysyn and Dr. Isabelle Kaprielian-Churchil and the executive director of the Montreal Institute of Genocide Studies, Kyle Mathews. “In celebrating Canada’s 150th anniversary, we demonstrated to the world, our country’s diversity, unity, and unparalleled legacy in upholding our shared values of respect, tolerance, and intercultural dialogue,” said Shahen Mirakian, president of the ANCC. The opening remarks of the conference was delivered by the president of the UCC, Paul Grod, while president of the ANCC, Shahen Mirakian, concluded the event with remarks on behalf of the ANCC and the organizing committee. Both community leaders commended the work of everyone involved in organizing such an important conference and stressed the importance of working together, as we remember our past and shape our future as Canadians. “Our objective was to provide a cross-Canada platform to share, learn and understand from our experiences and to further our commitment to human rights by empowering those who want to make a difference, strengthen, and enhance Human Rights, Fundamental Freedoms and Canadian multiculturalism” concluded Mirakian.